DANCERS, ages 18-24 years, DanceWorks Chicago is excited to invite you to present yourself at our Open Company Audition for SEASON 13! Click HERE for an audition flyer. Team DWC looks forward to welcoming you and getting to know your work on stage of the Dance Center of Columbia College, 1306 South Michigan Avenue. Directions and parking information can be found HERE. We realize that there is expense involved, so resumes and photos will only be collected from dancers remaining on stage at the end of the audition. 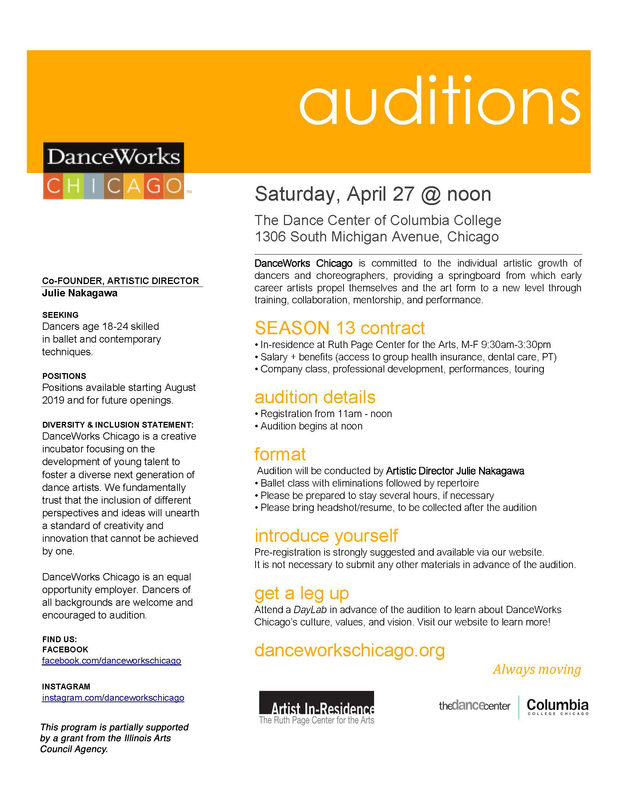 Remember, this audition is open to a public audience as part of DanceWorks Chicago’s on-going effort to illuminate the work of art. Audience members may come and go throughout the day. DanceWorks Chicago is committed to building a foundation for early career artists by providing a laboratory from which dancers and choreographers propel themselves and the art form to a new level of artistry through training, collaboration, mentorship, and performance. Thank you for joining us in this journey. Pre-registration will be available in February!